A few autographed copies from my collection. I didn't realize I was a collector of signed books before a few weeks ago. You see, I've never collected anything before, well, nothing that I cherished with such reverence. Of course, if you listen to my parents, they'll tell you about the loads of shiny rocks and gemstones that they still find tucked in various corners of their house, the approximately 1,072 comic books boxed up in their basement, the old coins from around the world shoved in a drawer, and the vast legion of action figures and Barbies (mostly sans heads) that must be somewhere in the house. But I digress. It started innocently enough with a Jasper Fforde novel several years ago. The copy I received from Amazon just happened to be signed. Then, a few years later I saw Charlaine Harris and, even though I wasn't a fan of the Sookie Stackhouse novels, I figured I should get a signed copy since I was there. A year or so later, William Gibson came to town and I just had to get his autograph. I mean, I've loved Neuromancer ever since I first read it in my Sci Fi, Tech and Cyberpunk class in undergrad so of course I was going to take the opportunity to meet him. (We had a deep and meaningful 30 second discussion about his watch while he signed and I tried not to faint.) And well, now the whole thing has just snowballed. I was trolling the internet for a first edition of Good Omens the other day when I realized it might be becoming a bit of a problem. 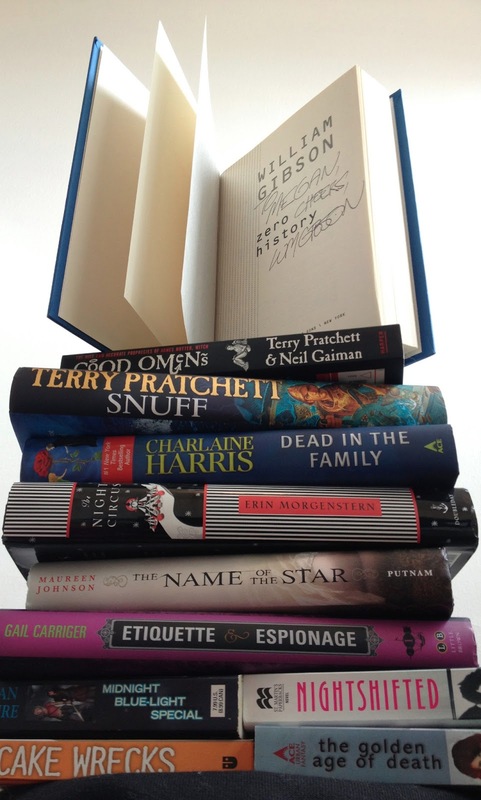 I'd like to have a copy signed by Neil Gaiman when I meet him in June, but if you look at the stack of books in the photo above, you'll see I already own an autographed copy. That's when it dawned on me: if I keep this up, there's a statistically significant chance I'll be one of those people found crushed to death in their home under a toppled stack of books. WHICH SOUNDS UBER DISTURBING. SERIOUSLY, WHEN DID I TURN IN TO SUCH A CREEPER? So, I'm in search of your advice. What do you collect and how do you manage your treasures? How do you not sound like a total lunatic when talking about your prized possessions? Dude...my side of the bedroom has me..then books. Lots and lots of books. They fill our media room upstairs. If the neighbors knew, they'd flee. MUAHHAHAHAHA! I knew we were kindred spirits, Kristin. You could always get your kindle signed. I'm the same way! Besides trying to collect autographed books from my favorite authors i also tend to try and collect the hardcover versions. I love to display them on my shelves, and the hardcovers just give a certain look for me that i love. I also love trying to find a way to get the books autographed especially since i can't always go to the author for them. I definitely prefer the hardbacks, too! Oooh when I see Neil Gaiman in June, I was thinking of bringing my copy of Good Omens for it to be my second book that I get signed. It's a first edition and it would be sooooo cool. I have a bunch of signed Ray Bradbury books. I actually got to WORK with him when he did a book signing here many years ago. We was very cool to an awestruck pre-teen geek and signed a stack for me. Almost all of my Patricia Briggs books are personalized. I await my next chance to see her, or when I am motivated enough to send them to her, so they will all be signed. I kind of overwhelmed her one day when she stopped by the Borders where I moonlighted.....such a nice lady to indulge her geeky fan. Oh, that was nice of her. Do you display them? Top shelf of the bookcase, and nobody is trusted enough to borrow those babies! She is one of the nicest authors I've gotten to meet. Is there a good site for author signings in the Bay/South Bay Area? Where I live they are few and far between, so I need to start hitting them when I travel for work. I don't know of anything in the South Bay, but for San Francisco, sign up for The Booksmith's and Borderlands' event emails. Borderlands is a Sci Fi and Fantasy bookstore in the Mission and the Booksmith is a general bookstore but they often do SFF events. Mira Grant's Feed? You ought to come down to SF next time she publishes a book. I think she often does signings at Borderlands in the Mission.